Today, we will review the negative form of sentences in Simple Future Tense. If you need more help on this, please go back to Lesson 40. 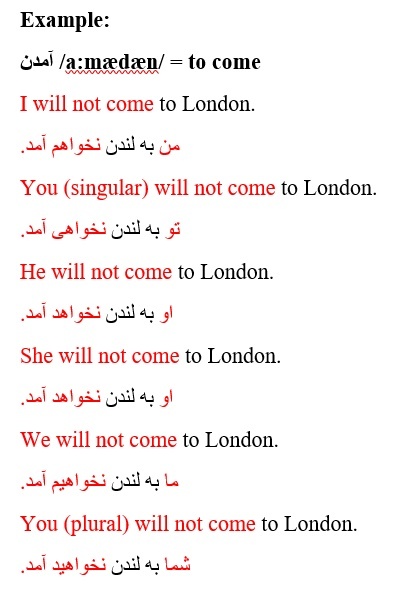 I will not use the same ten verbs we have so far used in the past few weeks. Please follow the examples and finish the job. Enjoy! I will not go to Brazil. من به برزیل نخواهم رفت. 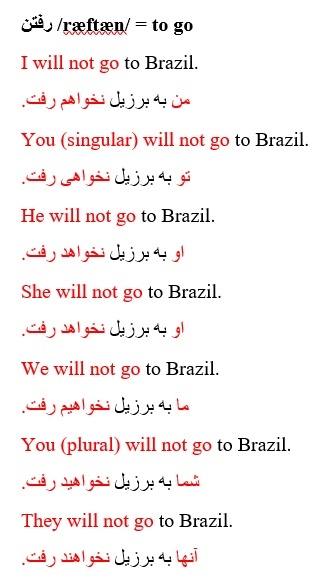 You (singular) will not go to Brazil. He will not go to Brazil. She will not go to Brazil. We will not go to Brazil. You (plural) will not go to Brazil. They will not go to Brazil. I will not eat lunch. You (singular) will not eat lunch. He will not eat lunch. She will not eat lunch. We will not eat lunch. 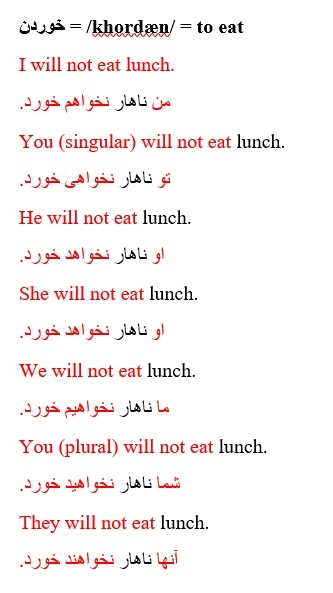 You (plural) will not eat lunch. They will not eat lunch. I will not listen to the radio. من به رادیو گوش نخواهم کرد. 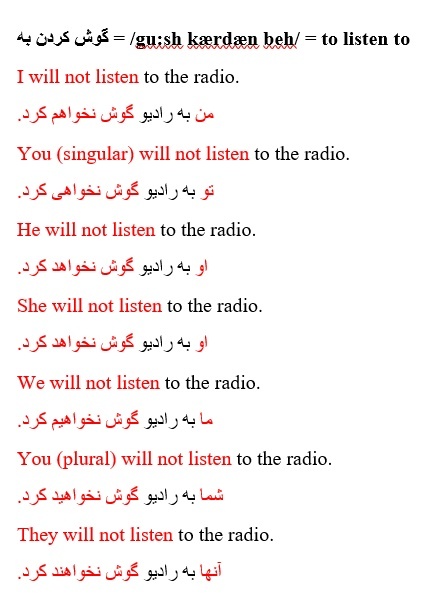 You (singular) will not listen to the radio. He will not listen to the radio. She will not listen to the radio. We will not listen to the radio. You (plural) will not listen to the radio. They will not listen to the radio. I will not see your friend. من دوستت را نخواهم دید. You (singular) will not see your friend. He will not see your friend. She will not see your friend. We will not see your friend. 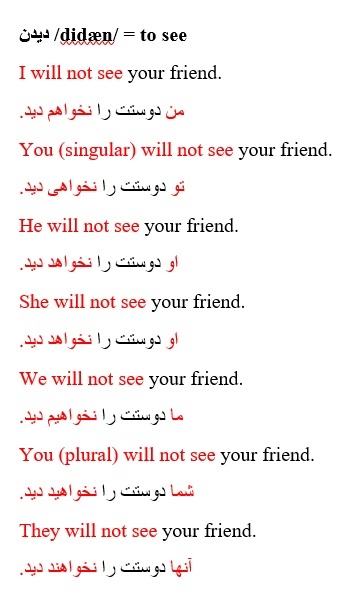 You (plural) will not see your friend. They will not see your friend. I will not read a book. You (singular) will not read a book. He will not read a book. She will not read a book. We will not read a book. 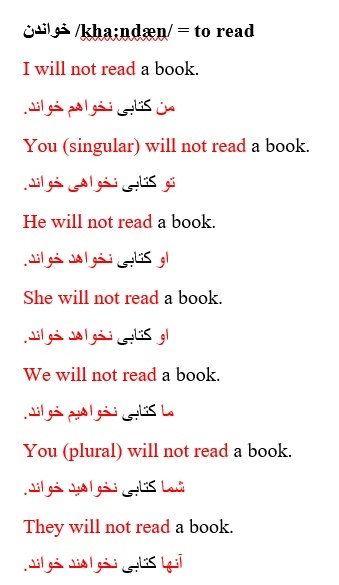 You (plural) will not read a book. They will not read a book. I will not write a letter. من نامه ای نخواهم نوشت. 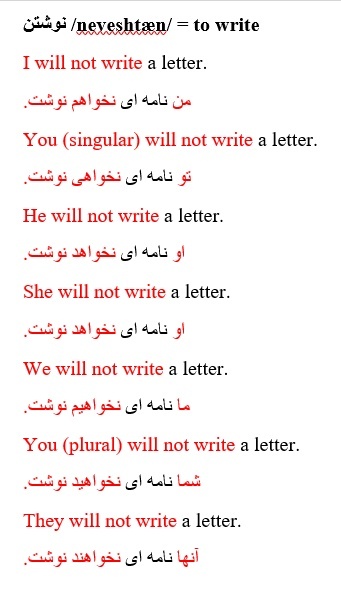 You (singular) will not write a letter. She will not write a letter. We will not write a letter. You (plural) will not write a letter. They will not write a letter. I will not clean my car. من ماشینم را تمیز نخواهم کرد. You (singular) will not clean my car. He will not clean my car. She will not clean my car. We will not clean my car. 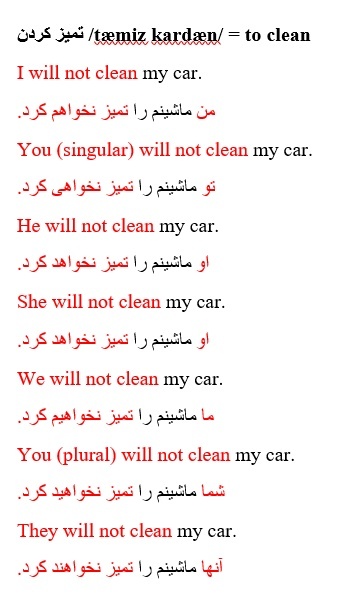 You (plural) will not clean my car. They will not clean my car. I will not sell my house. من خانه ام را نخواهم فروخت. 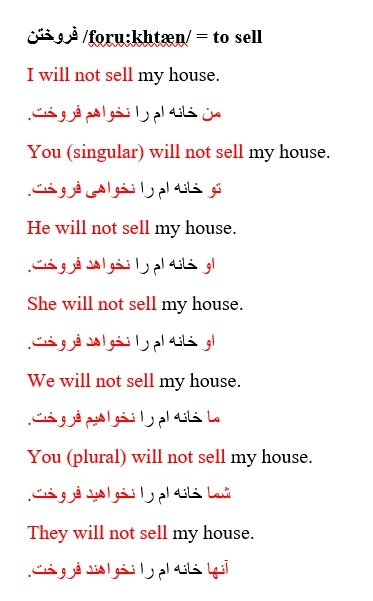 You (singular) will not sell my house. He will not sell my house. She will not sell my house. We will not sell my house. You (plural) will not sell my house. They will not sell my house. I will not wash the dishes. من ظرف ها را نخواهم شست. You (singular) will not wash the dishes. He will not wash the dishes. She will not wash the dishes. We will not wash the dishes. 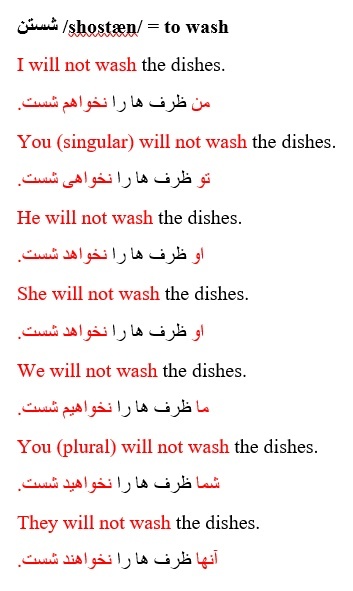 You (plural) will not wash the dishes. They will not wash the dishes. I will not buy a car. You (singular) will not buy a car. He will not buy a car. We will not buy a car. 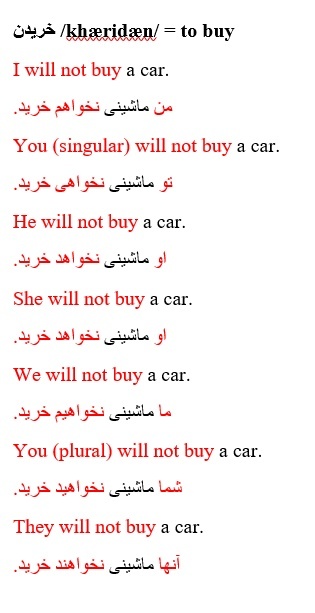 You (plural) will not buy a car. They will not buy a car.